Tarillo Vue provides roof inspections that tell the true story. 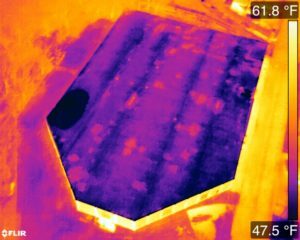 We capture the roofs condition as is, identifying moisture within a roof system and confirming its presence with physical testing. The evidence we provide is hard to argue. Part of your job in getting good results on a roof claim is to prove the moisture and present condition of a roof is the result of a storm or natural disaster. Our correlated visible and thermal images tell the story. If you even just glance at the image here, you can suspect the condition of this roof is probably not very good.